Looks like a good photo of some resident killer whales until you look closely and realize that all the dorsal fins are not going in the same direction. 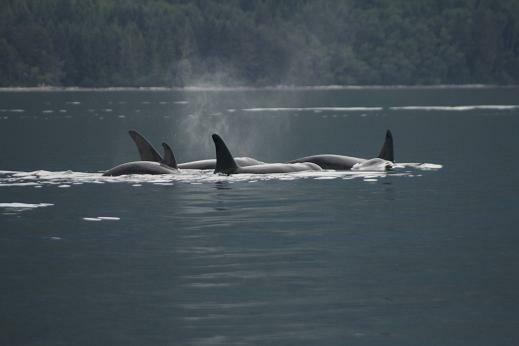 Resident orcas are the ones that eat salmon. This was an occasion when they stopped travelling and started to feed. From this point on they stayed in the ripe tide off Craycroft Point and fed on salmon for over an hour. We turned off our engine and sat in the ripe while the orca fed all around the boat.